The Princess doll has come along well in the last few days. 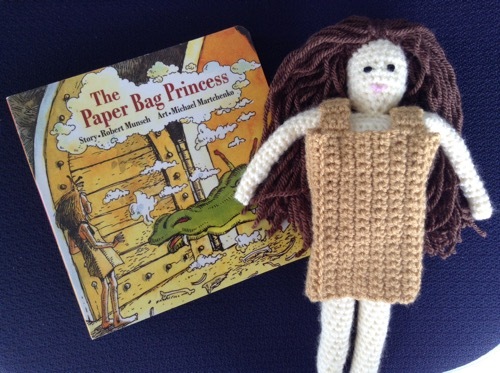 Her paper bag dress is done, but her crown is not. I did try it with some yellow yarn but it came out too big and I’d like to find some metallic gold embroidery thread. Considering how much girls like to dress dolls, I decided to make the dress and cardigan from the same pattern but had to take a break when my wrist hurt too much. I’ll show you those next time. The grapevine wreath on my kitchen wall was looking very outdated as it still held the crocheted fall leaves, pumpkins and sunflower from autumn. 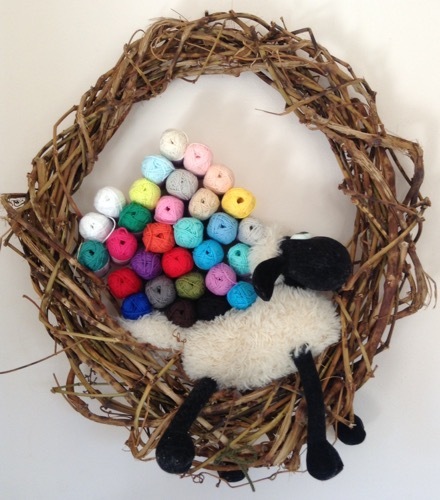 Today it was taken apart and, considering my crochet output is so little at the moment, I cheated by using my Shaun the Sheep and a bunch of cotton minis from the stash to fill the wreath. It will have to do until I can up my game! My wrist was quite sore yesterday and again today, and I think it’s partially due to exercises I did after watching a couple of physiotherapist videos on You Tube and partly the crochet. It worries me a little, but not having anything to compare with means I don’t know if my healing expectations are reasonable. The skin is sensitive around my wrist – cuffs chafe unpleasantly now that I’m leaving off the brace more during the day – and the joint is still quite inflexible. Next appointment is April 10th, and hopefully all will look good. I wanted to show you the result of my yarn play today, while the electrician and plumber made big holes in our ceilings and walls. And a big mess on the floor.